The fertility tracking industry within wearable tech is growing fast, and for good reason. Quantifying and tracking ovulation is a growing trend, as couples seek to get pregnant later in life. And while the Royal College of Obstetricians and Gynaecologists warns that falling pregnant after the age of 35 can be difficult, a new generation of smart fertility gadgets and clever apps are here to help. Wearable basal body thermometers, for example, help women track their ovulation cycle by reading their basal body temperature, aka their BBT, which is an indicator of fertility through the month. This data can then be viewed on a smartphone app to give users a better understanding of when they are likely to conceive, speeding up their chances of getting pregnant. These wearables can also come in useful for those wanting to avoid pregnancy naturally, too. We've taken a look at the trackers, gadgets and health apps that can help make a difference. Worn only at night, the Ava bracelet looks at nine physiological parameters then gathers millions of data points, which it sends to your smartphone. In the morning, you can check the graphs and info collected to see if it's an optimal time to conceive. This year, Ava conducted a study with the University Hospital of Zurich, which said that the device can detect 5.3 fertile days with 89% accuracy. Described as a 'wearable sensor', this design can be worn with an armband or attached directly to the skin to 'learn your cycle' by collecting millions of data points and tracking movement. 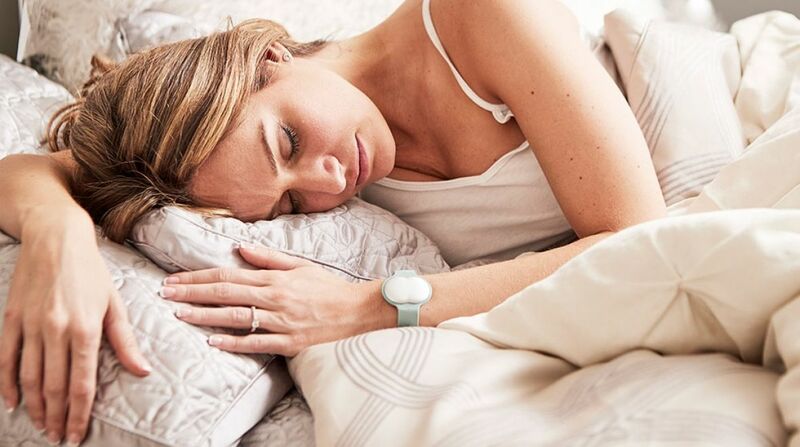 It has a three-axis accelerometer to monitor sleep quality and measures skin temperature as well as ambient temperature, which aims to give users a clear picture of their fertility. It doesn't have a dedicated app, but Tempdrop will work with a number of apps on Android and iOS, such as OvuView and Kindara, and let users share and switch their data to different apps as they please. The personalised fertility chart and ovulation calendar, with tips and in depth analysis, are easy to navigate on this app, which can be also synced with Jawbone, Fitbit and Withings as well as apps such as MyFitnessPal and Ovia Pregnancy. Ovia Fertility lets users fill out an in-depth diary to get a better understanding of their reproductive health, which can even be printed out for the doctor. It will chart moods, symptoms, activities, sleep and blood pressure, plus how much food and glasses of vino consumed. Describing itself as 'confident, scientific and not pink', which is always a bonus, this period tracker app for Android and iOS uses personalised data surrounding the menstrual cycle, pain, mood, fluid, sexual activity and more to predict when the user will be at their most fertile. The app includes information about fertility too, answering questions such as 'is my cycle normal?' and 'when can I get pregnant?'. This app gives you your daily chances of conceiving as well as health tips and advice. Once you register it gives you the option to 'choose a journey' – whether you're trying to conceive, avoiding pregnancy or need help managing your fertility medication. You can sync with MyFitnessPal, Misfit and Fitbit for information on nutrition and calories too. The best bit is that as well as being able to connect with your partner via the app, it offers daily logs and health tips for men too, letting them track their sleep duration, fitness and proximity to heat, which all factor in the road to conception, apparently. This oral basal body thermometer claims to take temperatures up to four times faster than standard thermometers. It also has a vibrating, as opposed to ringing, alarm to let the user know when it's time to take their temperature, which may come as a welcome feature to a sleeping partner. It's designed to work alongside the popular Kindara app for Android and iOS, and wirelessly sync information to give the user instant insight into their reproductive health. On the app, women can access personalised information to help them get pregnant, as well as chart sexual activity and health concerns and connect with other users for support. In order to get the most accurate results from basal thermometers, the user must take their temperature every day at the same time. This can prove a challenge with oral and underarm methods, but this in-ear basal thermometer can be worn all night to continuously monitor basal temperature. This means the user can fall asleep with the silicon-encased earbud in and don't have to worry about waking up at the optimum time every day. It will beam information it collects via Bluetooth to the Yono smartphone app once it's in its base station. Plus, it only needs to be charged once a week. After every temperature reading, this oral basal body thermometer displays a woman's fertility status on its built-in monitor – red for fertile, and green for infertile, so it's a great design for people with hectic schedules. It claims to have an advanced temperature sensor that has one-hundredth of a degree precision and its algorithm – backed by the Lady-Comp with a proven track record of more than 28 years – claims to be 99.3% effective. Designed to work alongside the DaysyView app for iPhone, Daysy to will learn your individual cycle pattern over time by analysing and storing data. Bellabeat's Shell app can be used on its own, for free, or with Bellabeat's nifty accessory add-on. It works to amplify the sound of your baby's heartbeat when pressed to the mother's body, as well as to let you record the audio and even share it with friends and family via the app. No waves are sent into your body, it's purely capturing sound, so it's safe and is intended as a bonding device rather than an alternative to regular appointments. Bloomlife is a wearable pregnancy sensor with a twist – you're not supposed to wear it the whole time but for one, two or three months of your third trimester. It sticks onto the belly and measures the count and timing of contractions (both Braxton Hicks and labour) via electrical signals from the uterine muscle. Data on your contractions is then sent to be viewed on the companion iOS and Android app. The team behind it has done four clinical studies to show the tech can track changes in contraction patterns. Elvie is a pelvic floor exercise device, an 'insertable' if you like. Providing all the benefits of a standard kegel device, it also provides real-time bio feedback and gives an LV score within an app – both iOS and Android versions are on offer. It packs motion sensors that track the muscle movements during kegel exercises and tells the user whether they are performing them correctly. You can use Elvie during your pregnancy as long as you are not suffering from any complications, but you should double check with your doctor first. The Ritmo Advanced Pregnancy Audio Belt provides a comfortable and convenient way to play music to baby in the womb. Portable and lightweight, it doubles up as a support belt and has a rechargeable battery that lasts for up to 15 hours. It links to an MP3 player or smartphone and has four mini speakers positioned around the belt to evenly distribute audio around the womb, at a decibel level that's safe for your baby's developmental stage. This Baby-Bump Sound System features two speakers that attach to the mother's tummy to play music and recorded voices to baby in-utero. The price includes access to VoiceShare, the company's voice-recording network that lets parents-to-be record a story, song or message, which can then be downloaded to an MP3 player and shared with the unborn baby through the speakers. It's a fun service for any parent or relative who wants to send a message remotely for the mother to download and play to her bump.